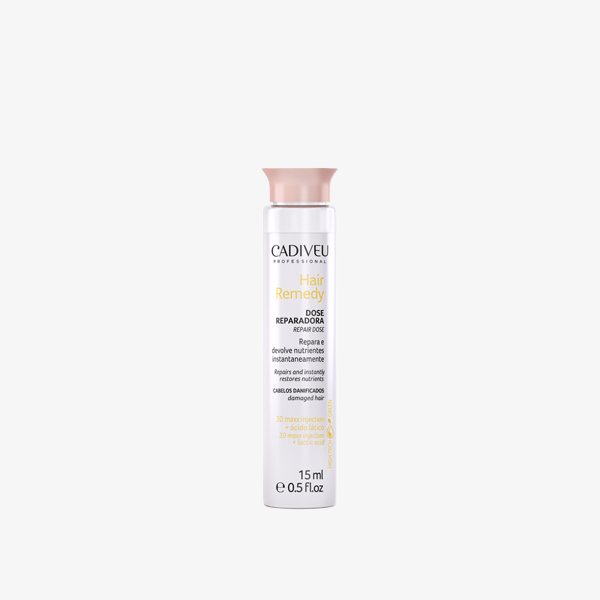 Cadiveu Hair Remedy Repairing Dose provides an extreme repair, has a special technology that ensures its penetration at all levels of the wire, from the cuticle to the deepest part, the cortex. Cadiveu Hair Remedy Repairing Dose provides an extreme repair, has a special technology that ensures its penetration at all levels of the wire, from the cuticle to the deepest part, the cortex. It still protects the hair from possible future damage and oxidation. Treat the wires so that the damages suffered are fully recovered. Its powerful active formula that regenerates capillary fibers, replenishes nutrients and repairs deep structural damage to the yarn, and counteracts porosity and instantly restores elasticity. Phytokeratin microspheres: they have powerful assets that will act in the recovery and reconstruction of the wires in the most damaged parts of the fibers. 3D Maxx Injection: Unique technology that recovers hair from damage, making it more resistant. It acts in the reconstruction from the inside of the threads, guaranteeing health and beauty. Patuá Oil: It originates from the palm of the Amazon, is rich in essential fatty acids. It hydrates, restoring the softness of the threads, as well as helping to combat porosity and protection. Biopolymers: regenerate the hair fibers from the inside, promoting a deep repair. Your hair is recovered from damage suffered, healthy, with a soft touch and intense glow. Hair intensely repaired and nourished, protected from future damages and extremely bright. Apply the Hair Remedy Restorative on clean and moist hair. Let act for 5 to 10 minutes and rinse. Wash hair with Shampoo, remove excess of water with a towel then apply Hair Remedy Restorative wick to wick twisting. Let act for 5 to 10 minutes, rinse thoroughly.